In 2012 I wrote a story about six of our local soldiers who had served in the Gallipoli campaign of 1915. At the time there was another soldier whom I suspected had served there but whose service records were short on detail to confirm it one way or another. Recently I came across a transcription of that particular soldier’s diary, carried by him throughout the war which confirms that he was involved with the landings of 25th April 1915 and would spend a total of eighteen days aboard the transporter Nizam working around Anzac Cove. That soldier was Percy Robert Thompson from Mount Kuring-gai and as we are four months short of the 100th anniversary of his enlistment in August 1914, I believe that his Gallipoli experiences are worth recording. Percy Robert Thompson was born in Paddington in 1891, the second child of Robert and Susan Thompson. Percy had a sister Lilian who was five years older than him. It is not known when the family arrived in Mount Kuring-gai, however at the time of Percy’s enlistment they were living at a house known as ‘The Pines’. A former long term resident of Mount Kuring-gai, Vic Jefferys, produced a map for the book ‘Memories of Mount Ku-ring-gai’ that places the ‘The Pines’ at the railway line end of Harwood Avenue, I suspect where the freeway now stands. Vic was raised in the Station Masters house just north of the current railway platform, across the road from the Thompsons. Vic had several older brothers and one of these, Ernest Howard Jefferys, was the earliest soldier named on Berowra War Memorial to enlist on the 17th August 1914. Percy followed Ernest two days later, enlisting with the newly forming 1st Field Company Engineers (F.C.E) at Moore Park on the 19th August 1914. Twenty three year old Percy was given the regimental no.160 and signed up as a driver. A driver in those times meant a driver of horses and Percy claimed to have been apprenticed as a driver for five years at various places to gain his trade. After a short period of training the 1st F.C.E embarked from Sydney aboard the SS Afric on the 18th October 1918 bound for Egypt. The ship travelled via Albany, Colombo and Aden before arriving at Port Said on the 3rd December 1914. By the 10th December 1914 they had arrived at Mena Camp, Percy’s diary noting ‘Splendid weather right through’. The 1st F.C.E remained at Mena Camp until the 28th February when as part of the 1st Australian Division they were ordered to sail to the island of Lemnos as the advanced troops for the seizure of the Gallipoli Peninsular. On the 2nd March 1915 they embarked, Percy’s service records noting that on the 3rd March 1915 he ‘proceeded to join the Mediterranean Expeditionary Force’. This is the only notation on his record evidencing his role at Gallipoli. Percy was on board the transporter Nizam which arrived at Lemnos on the 4th March 1915 and remained there until the evening of the 24th April 1915, by which time the invasion fleet numbered two hundred ships. On that Saturday night the Nizam headed north-west to the island of Embros, close to the Gallipoli coast where it anchored amongst the fleet awaiting the landings the following morning. So what exactly was the role of the 1st F.C.E during the landings at Gallipoli? The 1st Field Company, which was determined to uphold the reputation of New South Wales, being the only unit from the State in the covering force, was divided up so that a party could accompany each assaulting infantry battalion. Leaving behind its drivers, horses, and tool carts (which all, in due course, returned to Egypt) the detachments embarked on H.M. Ships Prince of Wales, London, and Queen, the transport Nizam, and destroyers, on 24 April. The party on board the Nizam made up barrel piers which were to be joined to form a jetty for taking off wounded. 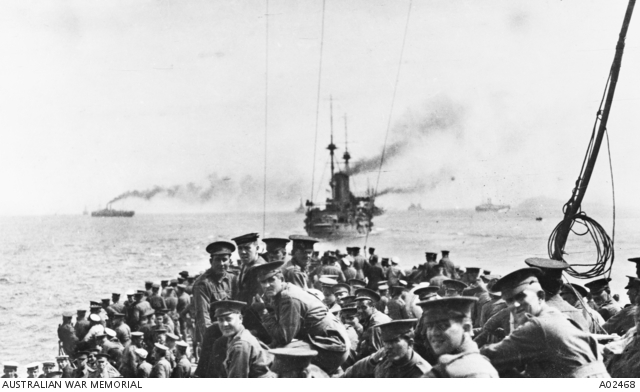 The convoy arrived off Gallipoli at 2 am on the 25th. “Thousands of infantry men landed about 4 o’clock on the open beach, leading off with bayonet charge under heavy shrapnel and machine gun fire, some never landed, killed or drowned before getting ashore. Captured a good slice of hill- warships pumping iron all day especially in the evening when they opened up extra heavy on the enemy’s left flank- literally blew the top of a big hill off and wrecked a little fort to the right on beach, they were shooting right over the Nizam. We went in rather close to land pontoons and shells were chucked at us a treat, shrapnel landing on the boat. Engineers building wharf under fire reported 3,000 casualties till 2 o’clock. Indian Mountain Battery landed afternoon- watched them scrambling up the hill with mules- could not land artillery, reason so much enemy’s shrapnel flying. Steam pinnaces towing big strings of boats full of wounded all day to hospital ship. Ordered to clear out about 6 o’clock as things were getting too willing in the shell line. The Prince George. Majestic, Queen, Lord Nelson and another returning compliments all together, saw war happening- worked till 11 pm making rafts”. The Nizam moved back out to sea away from enemy shellfire and did not return to Anzac Cove until the 27th April. At a distance of ten miles Percy wrote of hearing the shelling. On the 27th the Nizam returned to Anzac Cove not only to land the rafts but also to pick up wounded soldiers, the numbers of which had been underestimated. “Still shelling away, making good progress, went alongside Hospital ship and transferred wounded. Working on rafts till ten o’clock- expect to go ashore anytime now”. “Heavy rifle fire- fifty reinforcements went ashore last night, shrapnel and lyddite galore- Turks making a night attack, going all night. Hospital ships look well, have green lights and a red cross. Came in close and received a warm reception, fifteen shells falling in a very short time- one lobbed in store ship- carried away derrick and part of the bridge, skittled two and wounded seven”. I believe the attack Percy referred to was an attack made by Australian and New Zealand troops led by Colonel John Monash on the hill Baby 700 during the night of the 2nd May. This attack was supported by a naval and artillery barrage and ultimately drew a spirited defence from the Turks on the Australians right flank early in the morning. The entries over the following days show that although shelling was still active the conditions were becoming quieter and nine days later on Wednesday 12th May 1915 the Nizam left Gallipoli for Alexandria. Percy arrived back in Alexandria on Friday 14th May and unloaded the horses over the following days. On the 17th May they moved the horses to Camp Mex, south of Alexandria. The camp itself being the site of fortifications used during the Egyptian War of 1882. Percy would remain in Egypt throughout 1915 tending to the horses and exploring the area when he had leave. His role as a driver possibly kept him from returning to Gallipoli. Australia’s involvement there ended on the 20th December 1915 when the last of our troops left Anzac Cove. (Photo -Tel el Kebir, North Egypt. February 1916. Limber wagon used to cart tools, bringing two barrels of beer for 1st Field Company Engineers Sergeants’ Mess. On the right is Sergeant Tom Newson. (Donor E. G. Lloyd). Percy was probably not aware of it at the time, but during the Gallipoli landings Berowra man Private Richard Kelly was nearby on another ship busily tending to the wounded with the 1st Field Ambulance. Richard Kelly had enlisted five days after Percy on the 24th August 1915. These two were our only soldiers to serve during the landings, although five others would later serve there including Percy’s neighbour Ernest Jefferys of the 2nd Battalion A.I.F who would suffer a wound to his scalp during the fighting at Lone Pine in August 1915. In March 1916 Percy embarked for France where he would spend the rest of his war serving with the 1st F.C.E on the Western Front. He eventually returned to Australia late in 1918. I will write more about Percy’s experiences on the Western Front in the future. Original story Written by Scott Wilson and reproduced with his kind permission. Note: the 1914-1918 Diary of No.160 Lance Corporal Percy Robert Thompson was transcribed from the original by Glenn McIntyre. A copy of the transcription is held by the Royal United Services Institution of NSW and I thank them for allowing me access to it. – Scott Wilson. From Alexandria to the Somme, Percy Thompson’s 1916. When I last wrote about Mount Kuring-Gai’s Percy Thompson of the 1st Field Company Engineers (FCE) he had just returned to Egypt in May 1915 after serving on the transporter ‘Nizam’ off the coast of Gallipoli during the time of the landings. Percy was a driver responsible for the companys’ horses and when it was found that they would not be able to land nor require the horses on the Peninsula the drivers were returned to Mex Camp, south of Alexandria. After arriving there Percy soon fell back into the swing of things and apart from tending to the horses he was apt to record his disdain of authority within the pages of his diary. On the 5th August 1915 Percy was charged with disobeying orders when ‘he did contrary to orders(A and E Details) when taking his horses to water break off from parade and did take his horses through the lines of No.2 camp’. For his disobedience Percy was given two days detention and the loss of two days’ pay. Percy would have the last laugh though, recording within his diary that the detention was ‘put in looking at sports and swimming and general rest- in fact had a good twelve bob’s worth of sleep in, in the morning’. The 1st FCE remained at Mex Camp until the 2nd November 1915 when they began the move to Maadi Camp on the outskirts of Cairo. They arrived there the following day;Percy describingthe camp as a ‘dirty dusty hole’. Regardless of his attitude towards authority it would appear that Percy had adapted proficiently to the life of a soldier and before the year was out, on the 9th December 1915, he was appointed to the rank of Lance-Corporal. By the 22nd December 1915 the engineers were based at Tel-El-Kebir where they would spend their second Christmas away from Australia. Percy would note on Christmas Day 1915 that ‘Thanks to Captain Savage, Xmas dinner on Bully Beef’. Captain Percival James Savage of the 3rd Field Company Engineers, who would rise to the rank of Major by the end of the war and be awarded a Distinguished Service Order, was at that point in time awaiting the return of his unit to Egypt. Major Percy James Savage DSO. Australians in Egypt knew that they were soon to move to the Western Front, to fight the fight many believed they had signed up for. During the middle of February 1916 Percy was amongst a group of engineers sent to Serapeum for the defence of the Suez Canal. They were near a rail head and were ‘Working on lines of communication, laying water piping to trenches, canal pumping and different jobs’. They completed the work around the 14th March 1916. Percy would write that ‘Water came through to rail head, about 4 ½ miles from Canal- Light Horse taking over trade- moving away soon’. Exactly one week later the transport section of the 1st FCE were in Alexandria Harbour loading horses aboard the transport ship ‘Knight Templar’ bound for Toulon and then on to Marseilles. The ‘Knight Templar’ arrived in Marseilles on the morning of the 28th March 1916 at around 10 am. The following day the transport section moved to a camp at La Valentin just outside Marseilles where they stayed until the 11th April 1916. On that day they entrained at Marseilles for the long journey north to Abbeville as they approached the Western Front. On the 13th April 1916 the transport section arrived at Abbeville and several days later headed towards the front, their destination Bac Saint Maur. The engineers were moved to a quiet sector of the Western Front to ease them into trench warfare. A fortnight later on the 24th April 1916 Percy had his first experience of war in France. ‘Easter Monday. First visit to firing line, out in charge of wagons. Bit of shrapnel kicking about- Taube reported bagged. Aeroplanes galore- some of our fellows reported skittled’. A Taube was a German reconnaissance aircraft which was often used to direct artillery fire onto the enemy. Things were heating up and although Percy reported that some of the 1st FCE were ‘skittled’ the earliest casualty amongst their number would appear to be twenty one year old Sapper Arthur William Wright of the 11th Reinforcements who suffered a gunshot wound to his right shoulder that passed through his lung. A stranger coincidence is that Arthur Wright was wounded on the 25th April 1916, exactly one year after the 1st FCE casualties occurred at Gallipoli, an anniversary that Percy noted in his diary. The months of April, May and June 1916 are missing amongst the war diaries of the 1st FCE and although the 1st Division AIF were in an area known as the ‘nursery sector’ due to its relatively low level of activity the war was certainly still raging and Percy’s diary provides some insight into what was occurring. Whilst in Bac Saint Maur the engineers were billeted in an old factory. The transport section were equipped with general service wagons, pontoon wagons and tool carts which attracted the attention of the previously mentioned Taubes and the German artillery. Percy recorded on the 1st May 1916-‘8 o’clock- shells coming over thick and fast. 8” howitzers- chased out of stables- part of stables wrecked, also sleeping hut- Taube directing fire- luckily none of our fellows seriously hurt. Pontoon wagons believed to have drawn fire- one paddock fairly rooted up- 58 shells lobbed, no horse hurt’. The shelling occurred again several days later on the 5th May 1916 when- ‘Again they have a smack at our stables and luckily got the horses away in time. 8” howitzer again- women, children, old men running out of homes, some very pitiable sights. Night out in charge of teams- heavy bombardment by our artillery’. Two days later the section was moved two and a half miles further behind the lines, safely out of range of the German artillery. On the 8th June 1916 Percy wrote- ‘Poor old Freddy hit- walked into Estaires 4 ½ miles to try to see him, lobbed home wet and tired”. Freddy was 183 Sapper Frederick Sheldon Johnson, one of the original enlistees of August 1914. He was a plumber from Petersham, aged only nineteen years of age when he enlisted as the Company’s trumpeter. Freddy was one of the ex-militia engineers, serving with the 6th Field Company Engineers before enlisting. His service record indicates that he served at Gallipoli and after returning to Egypt he remustered as a driver alongside Percy at Serapeum on the 1st March 1916. Shortly after arriving in France he was remustered as a sapper on the 14th May 1916. According to Freddy’s service records, on the 8th June 1916, corresponding with Percy’s diary entry, he was wounded. Freddy received shell wounds to both arms (fractured), his back and left thigh. The wounds were serious and within five days he was transported to England for further hospitalisation. On the 31st August 1916 he boarded the New Zealand Hospital Ship ‘Marama’ in Southampton for his return to Australia. Freddy was discharged on the 26th December 1916 in Sydney and did not serve again. He had spent barely three months on the Western Front. Percy missed out on seeing Freddy in hospital on the day he was wounded but tried again the following day; setting out on horseback he ‘rode into Estaires and had a yarn with him’. Several years ago when I first started researching local soldiers I came across a book in the local history section of Hornsby Library titled ‘Memories of Mt. Kuring-gai’. The book is a collection of stories by former residents and amongst them was a story Vic Jefferys, the younger brother of Ernest and Frederick Jefferys, who both served in the AIF and were Percy’s neighbours before the war. Vic wrote of Percy that-‘Perce Thompson came back suffering from the effects of gas and was an invalid’. That Percy would suffer from the effects of gas was not surprising, many ex-soldiers did for the rest of their lives. Percy’s service records however did not record him being hospitalised due to gas exposure. Percy’s diary however provided further detail. ‘Friday 1 o’clock. Gas attack- stand to- damned near suffocated. Had a heavy cold and to make matters worse smells like spirits of salts and makes you cough a treat- lasted about 1 ½ hours- came from Ypres direction- no casualties in our crowd however, only headaches and sickly feelings together with rusty rifles and all brass wares dull and rusty looking’. The diary provides evidence of Percy’s exposure and I would presume there would have been other occasions when he was exposed to gas puddling in low areas as he drove waggons on the roads leading to and from the front lines. It is entirely likely that the cumulative effect of the exposure over time left his lungs in a poor condition later in life. Percy’s description of dull looking brass wares and rusty rifles are both indicative of the presence of chlorine gas. On the 20th June 1916 the 1st FCE left Bac Saint Maur for Aldershot Camp near Neuve Eglise in Belgium. They remained there for five days before moving back in to France. Percy was as always optimistic about the camp, describing it as a ‘miserable camp, rained during our stay of five days’. An image from the AWM showing the 10th FCE camp between Neuve Eglise and Messines. Note the pontoon wagons. On the 25th June 1916 the 1st FCE set up in billets at Romarin.They would remain there until the 1st July 1916 when they started heading south for their involvement in the Somme Offensive which had kicked off that day with massive advances attempted by both the British and French armies. The 1st FCE were to be blooded at Pozieres on the 23rd July 1916: Percy would not experience Pozieres as fate took a turn in his life when on the 29th June 1916 he suffered a fever. ‘Had a fine little hut and comfortable until the 29th after dinner. Chucked a fever and got whipped off to hospital with malaria to Bailleul- evacuated from there on to hospital train 11 o’clock 30th June. Train absolutely crawled owing to big raiding parties getting knocked about. Fine comfortable train journey taking 12 hours. Arrived Wimereux Australian Hospital, Boulogne- pretty tired and umpy- stayed there’. Percy’s service records indicate that he was taken by the field ambulance mento No.2 Casualty Clearing Station with a fever on the 30th June 1916 before being transported to the Australian Hospital at Wimereux.It was there that he was diagnosed with malaria and was transported on to England on the 2nd July 1916. Percy spent time from the 3rd July 1916 at Bagthorpe Military Hospital in Nottingham until the 26th July 1916 when he was moved to Harefield Military Hospital in London. No.2 Australian General Hospital at Wimereux. C.1917. Percy was discharged to No.1 Command Depot at Perham Downs on the 4th August 1916.Percy had some time on his hands at this stage, which he used wisely travelling around England and Scotland. Indeed near the end of his time at Bagthorpe Military Hospital Percy took the opportunity to travel into Nottingham and explore the markets. Percy recorded on the 6th August 1916 that he had been granted a fortnights leave and headed for London to visit relatives. On the 14th August 1916 he travelled to Wigan and onto Edinburgh the following day. On the 16th August 1916 he headed back south to Bradford where I suspect his father had originally come from. He wrote on the 18th August 1916- ‘Went to Manningham Park- had a good time on Lake Rowing- all went home per taxi. Afternoon: flew round in car with Arthur to Dad’s old haunts and went to his place for tea. Lobbed back, went to theatre. Came home had an evening, all there- about a dozen coming to see me off at the station’. Australian soldiers made the most of the opportunities to travel and see the old country whilst in England; Percy was like most soldiers. The holiday over,Percy arrived back at Perham Downs on the 21st August 1916 before moving on to Park House and finally Christchurch Depot at Bournemouth on the 26th August 1916. Bournemouth was evidently far more appealing to Percy- ‘Bournemouth a very nice place, fine pier and promenade. No surf bathing much, few nice girls, plenty of pubs- camp open, but too many parades- not having a bad time though’. He remained at Bournemouth until the 14th September 1916 when he proceeded to France aboard the S.S ‘Queen’. Arriving at Boulogne Percy spent the next two months at the notorious ‘bull ring’ at Etaples before returning to the 1st FCE. It wasn’t until the 20th November 1916 that he re-joined the men whilst they were resting in billets at Vignacourt to the north west of Amiens, in his own words ‘Arrived and found the boys paddling about in the mud at Vignacourt, which being a horse town was not much of a place to arrive back to work’. The 1st FCE left for the Somme on the 7th December 1916, moving to Franvillers that night and into camp at Fricourt the following day before finally arriving at Longueval on the 9th December 1916. They were moving back into the trenches and the worst winter of the war. Percy’s diary entry of the 7th December 1916 painted a bleak picture- ‘Left Vignacourt for the muddy Somme- raining all the time- arrived at Longueval or what used to be it- nothing but holes now and mud’. The sappers of the 1st FCE commenced work in the line on the 11th December 1916 and carried on through Christmas. The War Diary of the 1st FCE entry for Christmas Day 1916 read ‘No cessation of work today. Work proceeding as usual’. They were not relieved until the 20th January 1917. Percy recorded his second Christmas abroad in his usual sardonic tone- ‘Xmas Day 1916- Went out to 3rd Brigade HQ and horse and myself disappeared in a shell hole including Major’s blankets. Arrived home, the word home is a slander. Mud from top to bottom and received cards wishing a Merry Xmas’. Christmas 1916 may well have been Percy Thompson’s worst Christmas of the war, buthaving been spared the horrors of Pozieres, Percy would not have the same fortune in 1917. Written and researched by Scott Wilson (04/16). As 1916 came to an end Lance Corporal Percy Thompson was becoming war weary. On the 28th December 1916 he turned twenty five years old, spending the day ‘working and dodging Fritz’s coal boxes*- rather nice’ he dryly opined. Three nights later he saw in the New Year ‘spent in a dugout with a few bottles of Jonnie Dewar’s drowning sorrows’. The early months of 1917 found the 1st F.C.E remaining around the Somme Valley, moving slowly eastwards when Bapaume was taken in March. Around July they started heading north and were briefly in Hazebrouck in August before moving to Vieux- Berquin, east of Hazebrouck nearing the Belgium border.On the 7th September 1917 the transport section moved out of camp northwards into Belgium, but were ordered to return to billets that night, eventually moving out the following morning. “Left Vieux-Berquin for Dickebusch (Belgium) arriving later. Proceeded to dig ourselves in owing to Fritz being very active with bombs and shells”. The shelling was a portent of things to come during the following months. The 1st Australian Division, of which Percy’s unit were a part of, were preparing for another large push against the German army. 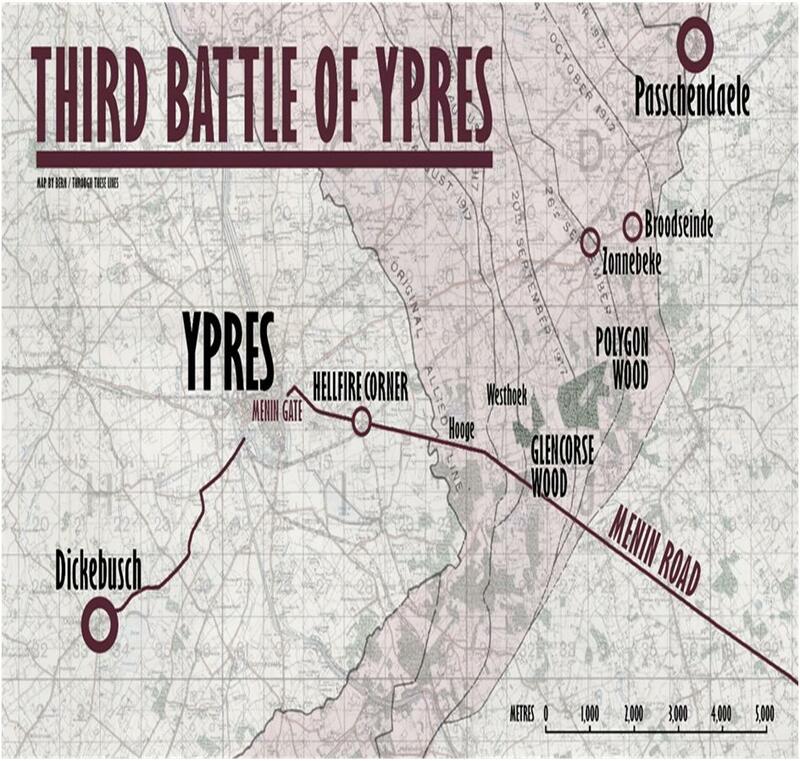 The Australian’s were preparing to enter the Third Battle of Ypres, which had commenced with attacks by British troops on the 31st July 1917. Percy was in charge of a team of drivers within the transport section of the 1st F.C.E and they established their horse lines to the south east of the shell wracked town of Ypres. Headquarters for the dismounted section of the 1st F.C.E were established to the north east of the transport section. They were closer to Ypres, along the road leading into it. Now the Germans weren’t merely aiming their guns on this road, they held the high ground and had registered their guns on the position and were deadly accurate. Percy’s role, being a driver, was to carry supplies up to the sappers constructing the positions and this involved driving a horse drawn General Service (G.S) waggon from the horse lines, through the shattered remains of Ypres and out along the Menin Road to Hellfire corner. The work on the gun positions was carried out from the 10th to the 17th of September 1917 when they were handed over to the 4th F.C.E. A map of Percy’s route. “Had a job taking a waggon out to where the gun possies are to be made, “Hellfire Corner”. Went through Ypres- a few streets & walls of buildings are all that remains of that fine town. 2nd Coy had a few casualties to date, also got shells and bombs. Have seen the order of the day & night since coming here. Horse lines copping it”. “Don Clarke killed and Tommy Ball wounded- shifted sappers to advanced billets”. Although not elaborated within his diary entry I have no doubt that these two men were mates of Percy’s. 184 Lance-Corporal Donald Clark and 86 Sapper Thomas Ball had both enlisted alongside Percy in August 1914 amongst the original establishment of the 1st F.C.E. Both had served at Gallipoli and both were killed by shelling that occurred on that day. Lance-Corporal Donald Clark was thirty three years old when he was killed. He was born in Scotland and was educated at Glasgow High School. An electrical engineer by trade, he had immigrated to Australia when he was twenty eight years old; he was buried in Belgium Military Cemetery. 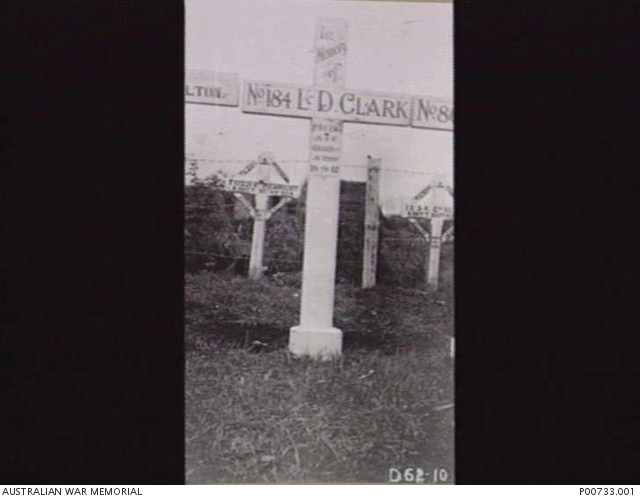 An image of ‘the original grave marker of Lance-Corporal Donald Clark exists within the Australian War Memorial Collection. Sapper Thomas Ball also suffered wounds from shelling and was evacuated to the 2nd Canadian Casualty Clearing Station. His records state that he suffered a shell wound to the left buttock penetrating the abdomen. He died of these wounds the following day and was buried at Lijssenthoek Military Cemetery. Sapper Thomas Ball was thirty years old when he fell. Born in London and educated at Flora Gordon Board School in Hammersmith, he had arrived in Australia around 1913. When he enlisted he gave his occupation as a railway construction worker. Sapper Thomas Ball had served at Gallipoli from the time of the landings till the 15th September 1915 when he suffered a strained back. He was evacuated to hospital in Egypt on the 19th September 1915 and did not return to duties at the base until the 15th November 1915. Early in 1916 he found himself in some trouble with the military authorities. Sapper Thomas Ball faced a court martial on the 17th March 1916 for (1) striking a superior officer and (2) using insubordinate language to a superior officer. An altercation had occurred with a military policeman and Thomas had taken exception to being ordered about by him. His precise words regarding the military police were that “you never find them in the firing line”. Sapper Thomas Ball’s actions resulted in a punishment of 62 days detention. In April 1916 he was provisionally appointed to the rank of Lance-Corporal. 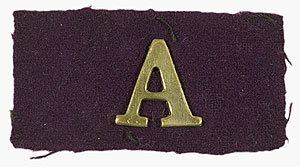 Sapper Thomas Ball held this rank for over a year, when he was reduced to the rank of sapper in April 1917 for being drunk; there is a sense that Thomas, like many other Australian soldiers, was not a great lover of authority. The gun positions both these men had given their lives for were being built for the heavy artillery to provide fire support for the battle which began on the 19th September 1917. 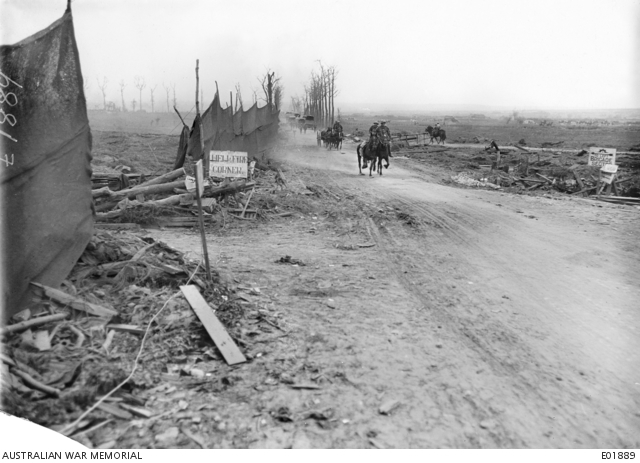 Known as the Battle of Menin Road, it was the first of three battles the Australians would partake in to gain the final goal of Passchendaele village itself. The 1st F.C.E became directly involved in the Battle of Menin Road on the 20th September 1917. At 8 pm on that night their commanding officer was given instructions that they were to relieve the 2ndF.C.E and 3rd F.C.E and carry on their work consolidating captured strong points and clearing/establishing communication trenches between them.The strongpoints were to the north east of the gun positions, along a track known as the Lone House Track near the Glencourse Wood. During this action the 1st F.C.E would lose two more ‘originals’. Percy’s recorded in his diary for the 20th September (or thereabouts) –“Sgt Baldwin and Corporal Hamilton killed and about 7 other casualties- spelling in a few days. Gained all objectives and a bit more”. 43 Sergeant Arthur Baldwin and 76 Corporal James Hamilton had also both enlisted alongside Percy in August 1914, had served together at Gallipoli and fell together just over three years later in Belgium. A statement later provided by Corporal Frederick Meads, also of the 1st F.C.E, placed them together, consolidating positions when the Germans attempted a counter attack. Several other men gave similar witness statements. Sergeant Arthur Baldwin from Stanmore in Sydney was only twenty two years old when he fell. He was a carpenter by trade and was serving with the 31st Infantry Regiment (a militia unit) when he signed up August 1914. A handy soldier by all accounts he had served at Gallipoli and had been awarded the Silver Star Second Class by the King of Serbia in recognition of his service during the Gallipoli Campaign. Soldiering ran in the family and his younger brother Harry Baldwin had joined the 1st F.C.E after a short period of service with the 6th Light Horse Regiment and the brothers served together from late August 1916. On the 1st February 1917 Sapper Harry Baldwin was struck in the head by shrapnel which fractured his skull and lead to his death the following day. They say brothers should not serve together and the grief the boys’ parents felt when they later were informed of Arthurs’ death is difficult to fathom. Young James Hamilton was also a carpenter and only twenty one years old when he fell. He was from Mildura in Victoria originally and served with the local 73rd Infantry Regiment before enlisting. He had received bullet wounds at Gallipoli and later at Pozieres in July 1916. James remains were never found and he is remembered on the Menin Gate, whilst Arthur lays at rest in Tyne Cot Cemetery. Percy was correct in saying that all the objectives of the Battle of Menin Road were met. The loss of four originals had been a high price to pay. The 1st F.C.E were rested on the 21st and 22nd September 1917 before returning to the tasks of repairing dugouts, strongpoints and roads. The second battle the Australians undertook occurred on the 26th September 1917 and was known as the Battle of Polygon Wood. 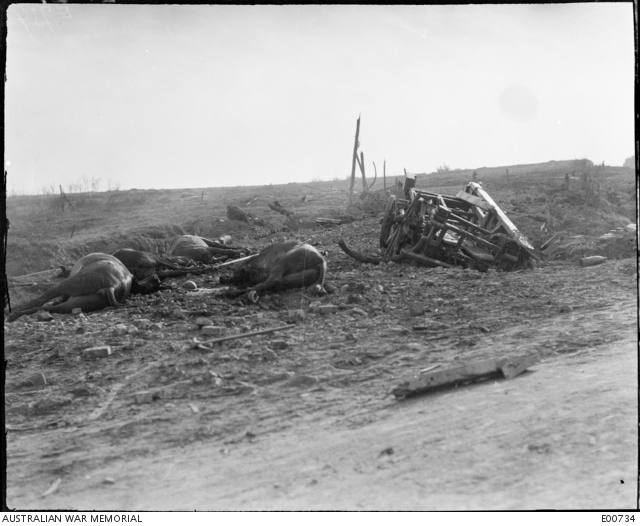 The attack itself took place early in the morning of the 26th September with troops of the 4th and 5th Australian Divisions in the vanguard. Although not involved directly with the attack, Percy was still amongst the shelling on that day and wrote- “4th and 5th Divisions having a smack, doing well, fair number of prisoners. 1st Division will be in again shortly for another hop over. Fritz shelling a bit. All transport getting knocked to blazes round Hellfire Corner and Zillebeeke, not forgetting chateau wood or sanctuary wood”. The 1st Australian Division weren’t idle as October 1917 arrived. The Battle of Polygon Wood was costly in casualties but successful. The Australians were pushing ever eastwards and this meant maintaining tracks that were already resembling a quagmire from rain in September and would only become worse in early October. Percy wrote on the last day of September 1917- “Out having a look at road to the line. Things pretty lively. Fritz shelling pretty heavy. Few narrow squeaks. Lad by ammunition dump blown up alongside me- rotten sight, men, horse and waggon going kite high”. The third and final battle of the Third Ypres Campaign was the Battle of Broodseinde Ridge which took place early on the morning of the 4th October 1917. The 1st F.C.E were to act as support for the 1st Australian Division troops once more, moving in behind the infantry, digging communication trenches and constructing strongpoints. All objectives were reached, but casualties were high and rain commenced falling heavily prior to and during the attack. Percy wrote of the battle the following day- “Yesterday big stunt successful- plenty of prisoners coming through. Our casualties about 22 to date, 8 killed. Got the big hill and after the ridge on the other side tomorrow morning, Saturday. 1st, 2nd, 3rd divisions taken all objectives”. The number of casualties the unit suffered according to the War Diary were 1 officer killed in action, 1 officer wounded, 6 other ranks killed in action, 22 other ranks wounded and 1 other rank missing. The Campaign should have wound up at around this time and the Australians be allowed to rest and strengthen their numbers. The rain that had recommenced falling on the 4th October had further turned the area into a quagmire where men struggled to move and artillery sank into the mud. Field Marshal Douglas Haig would have none of it and pushed on with two further costly attacks at Poelcappelle on the 9th October 1917 and Passchendaele village on the 12th October 1917; Passchendaele village would not be taken until 6th November 1917 by British and Canadian troops. “3rd anniversary of leaving Australia. Up at 3.30 am out to the line with wagons- pretty quiet, got home 2pm”. 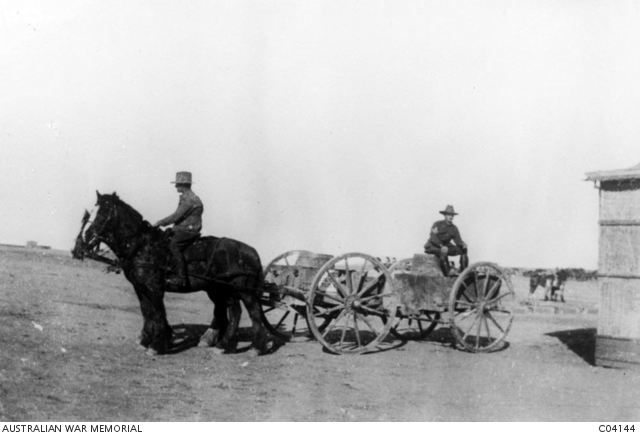 Percy drove the wagons for another two weeks before the withdrawal of his unit. The 1st F.C.E left Belgium on the 10th November 1917 and arrived at Samer, south east of Boulogne on the 19th November 1917. Not surprisingly on the 21st November 1917 a full day was spent cleaning the transport waggons. Percy left for blighty (leave in England) on the 20th November 1917 and did not return to France until the 5th December 1917. Perhaps the worst campaign of the war he would experience was behind him? I do not know. Percy’s diary does not delve into his feelings or emotions as to what he experienced during those ten weeks in Belgium. I imagine that he recorded the names of the four originals who died in Belgium because after three years of serving with them he knew them all pretty well. Perhaps he put those thoughts to the back of his mind and continued on. * Coal boxes- German high explosive shells that emitted heavy black smoke. Written by Scott Wilson (09/14) and reproduced with his kind permission. Acknowledgments: Map courtesy of Mr. Bernard de Broglio. Original story’s written by Scott Wilson and reproduced with his kind permission. Scott Wilson has a particular interest in the local WW1 veterans from the Hornsby- Kuring-ai Districts, and his writing has led him to discover the men of the 1st FCE. His extensive research and writing is an excellent addition to this project and we are looking forward to more of his wonderful work in the near future. Scott Wilson’s original stories have been published in the “Bush Telegraph Weekly” and “Behind the Lines” a project developed and managed by the Mosman library. 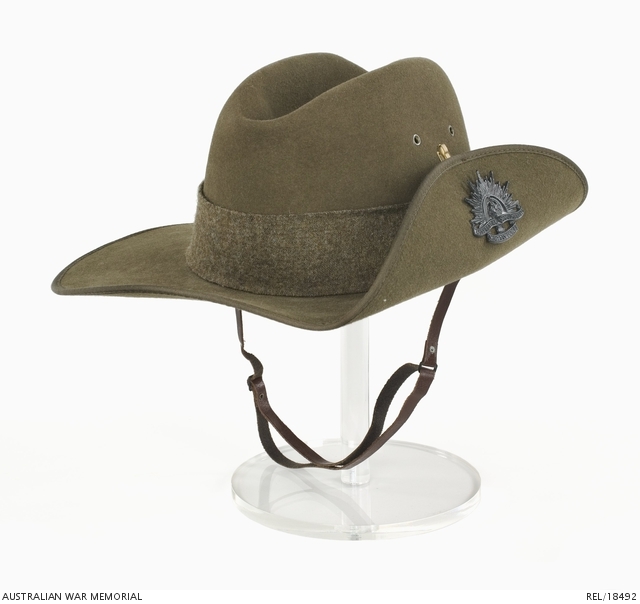 link – http://mosman1914-1918.net/project/blog/hircoll-a-soldier-with-a-mosman-connection .